Today in gym class, we were learning how to do some Track & Field activities to prepare for next week’s event. We were practicing how to run far distances without stopping. We ran to the trees and back to our door. We also ran around the pavilion, the swings, the equipment and back to the doors. We had to take some deep breathes to help our muscles get oxygen. 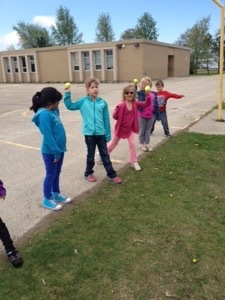 We were learning how to throw a ball far and properly. We tried very hard to stay away from windows.